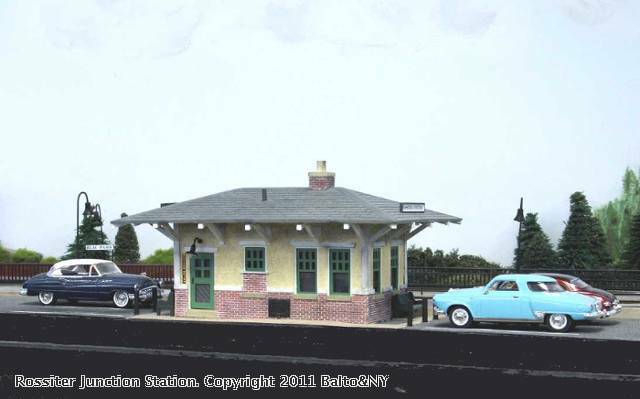 This Plasticville station was modified to resenble a small suburban stop. About 1/2" was cut off the bottom and re-applied to the top of each wall. The station body was fitted with scale 2X6 styrene joists at the top plate and the same 2x6 stock was used to make rafters and braces for under the roof. Brick sheet was added below the window sills and a coal door put on the side. There is also a drop door in the concrete sidewalk to reach the coal bin and cellar under the station. The platform is 1/8" foam core over which printed brick paper was glued with curbing edges painted with linen color acrylic. Lengths of rail painted black and insered into the platform were added to the parking lot stalls. Weathering is done with chalks. Light fixtres are Walhters HO scale parts. The signs on the station were computer printed on photo paper to resemble their porcelain prototypes.